The proprietors were Auguste Charrot and Alphonse Henry. According to his obituary, Charrot was born in Switzerland and came to the United States in 1880. He was in the watch case business for 10 years, after which he established Charrot & Henry. The business was first listed in the 1890 Brooklyn City Directory at 58 Flatbush Avenue on the corner of Livingston Street. According to court records, they were forced to move in 1906 when the City acquired and demolished a portion of their building in order to widen Livingston Street. The business relocated to 118 Flatbush Avenue and 571 Atlantic Avenue and was listed there through mid 1919. It appears that the 118 Flatbush Avenue and 571 Atlantic Avenue addresses both relate to the same building. A description of the building is contained in an April 29, 1906 classified advertisement by Charrot & Henry where they attempted to rent out the first floor. The advertisement stressed an entrance on both Avenues. Apparently Charot & Henry used the upper floors. Around the turn of the century, they were also local distributors for the Brotherhood Wine Company. 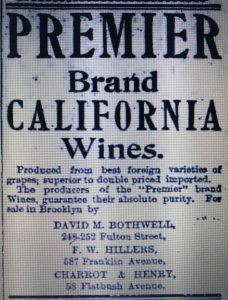 A story in the January 5, 1901 edition of the Brooklyn Daily Eagle headlined: “DO YOU DRINK GOOD WINE? Where the readers of this paper can buy good wines,” speaks of their association with Brotherhood. Messrs. Charrot and Henry of 58 Flatbush Ave say that the best Brooklyn families now use wine at table, the same as every family does abroad. This firm makes a specialty of Brotherhood Wines, made by Brotherhood Wine Co., established 1839. Quality and purity guaranteed. Be sure to ask for Brotherhood Wines. Get good wines. Do not buy cheap wines. If you have not tried the Brotherhood Wines for dinner or for entertaining friends you have missed a real pleasure. Best wines for the money in Brooklyn. Try them. Charrot and Henry cater to the best family trade. Ladies can stop at their store and leave their orders or you can call us up by telephone. They were also associated with Ballantine Ale. 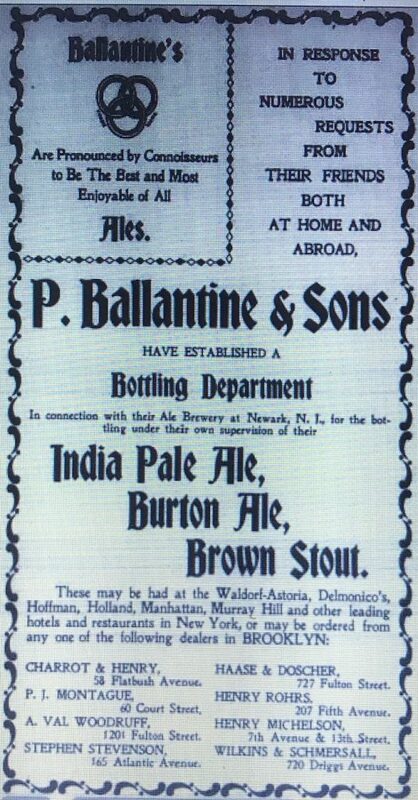 This 1897 Ballantine advertisement listed Charrot & Henry as one of eight Brooklyn distributors for their India Pale Ale, Burton Ale and Brown Stout brands that were brewed and bottled in Ballantine’s Newark New Jersey brewery. 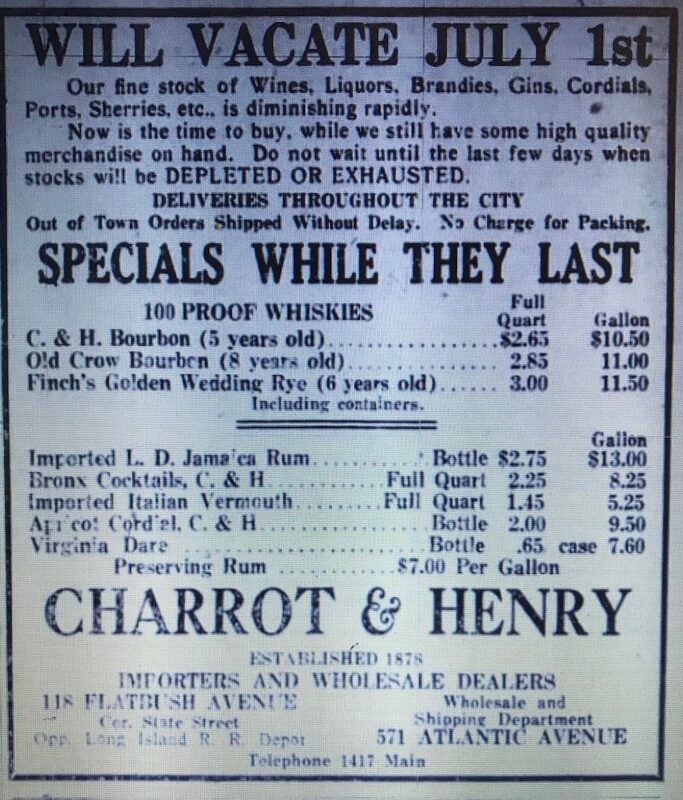 On the eve of Prohibition, an advertisement in the June 11, 1919 Issue of the Brooklyn Daily Eagle announced that Charrot & Henry were vacating on July 1, 1919 and that they were selling their fine stock of wines, liquors, brandies, gins, cordials, ports sherries, etc. 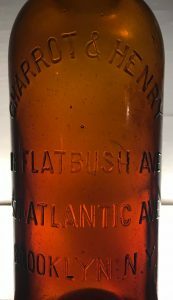 Two months later, they apparently had moved to 1 Hanson Place and had become the distributor for non-alcoholic beverages made by a company called Charles Jacquin. 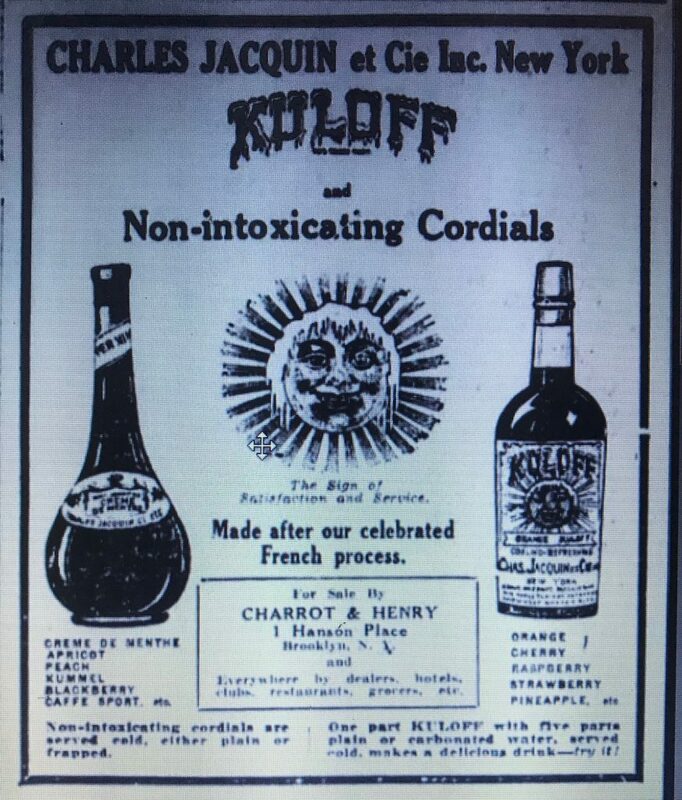 An August 3, 1919 advertisement in the Brooklyn Daily Eagle named them as the distributor for a beverage called “Kuloff” and other non-intoxicating cordials. This venture did not last long. Charrot & Henry was included in the 1920 Brooklyn telephone listings, at 306 Fulton Street, but they were no longer listed in 1924 (the next listing I have access to). Charrot’s obituary stated that he retired in 1920 and neither Auguste Charrot or Alphonse Henry lived to see the end of Prohibition. Charrot died in 1924 and Henry died five years later in 1929. The bottle I found is a quart size liquor bottle. 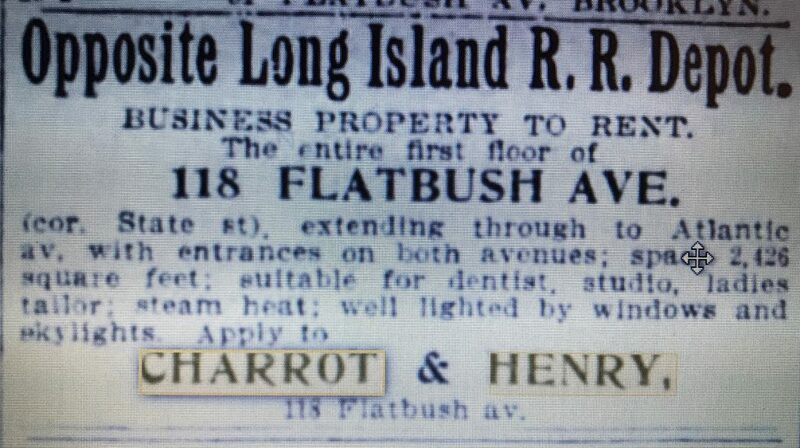 It has the 118 Flatbush Ave/571 Atlantic Ave addresses embossed on it so it was made no earlier than 1906. It’s mouth blown so it was probably made shortly after the move.